I was so excited to photograph this amazing couple, Liza and Alex. It was a beautiful day in April, just before it got too hot or the pollen got too crazy. Since they live in East Nashville, we started our shoot in that neighborhood. We met in the 5 points area near Red Door East. We walked across the street to one of the beautiful schools, by the farmer’s market to end up back at 5 points. We decided to go for another look and drove to Percy Warner Park for the last half of the session. The peaceful backdrop was perfect to balance out the craziness of East Nashville. 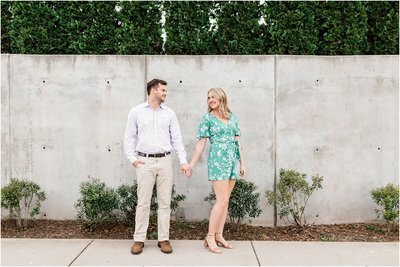 I’m really looking forward to photographing their wedding in October.